Ps 92:1 “ A song for the Sabbath day. It is a good thing to give thanks to Yahweh, to sing praises to your name, Most High; 2 to proclaim your hesed/loyal love in the morning, and your faithfulness every night, 3 with the ten-stringed lute, with the harp, and with the melody of the lyre. 4 For you, Yahweh, have made me glad through your work. I will triumph in the works of your hands. 5 How great are your works, Yahweh! Your thoughts are very deep. 6 A senseless man doesn’t know, neither does a fool understand this: 7 though the wicked spring up as the grass, and all the evildoers flourish, they will be destroyed forever. Observations: 92:1-8 The Sabbath day is a good day to gather with God's people to give thanks to Him for His works on our behalf, that cause us to triumph over the bad guys. The senseless fool doesn't quite get this, usually because they don't attract opposition and God isn't combating the wicked through them. 92:9-15 God delights in showing Himself strong on behalf of those doing His work, exalting and refreshing, and prospering them. It is through the righteous that Yahweh reveals Himself to be upright (fulfilling His promises), even in their old age. Application: Gather with others to give thanks to God for His help and encourage others to trust Him, so He can reveal Himself through them. Prayer: God, You are mighty and loyal, thanks for causing the righteous to flourish even in the midst of those who oppose them and You. Amen. Proverbs 22:1 “A good name is more desirable than great riches, and loving favor is better than silver and gold. 2 The rich and the poor have this in common: Yahweh is the maker of them all. 3 A prudent man sees danger, and hides himself; but the simple pass on, and suffer for it. 4 The result of humility and the fear of Yahweh is riches, honor, and life. 5 Thorns and snares are in the path of the wicked: whoever guards his soul stays from them." Observations: 22:1 Another “better” you'd better believe if you want what's best. 22:3,5 Most of the things we don't want in our lives are there because we failed to take proactive, preventative action (like brushing your teeth prevents cavities). 22:4 Who doesn't want these goodies? How do the Scriptures say you get them? Application: See if you can spell out the specific connection between the first and last parts of verse 4. If you can't, you probably aren't on track for the desired consequences. Hebrews 11:24-26 "By faith, Moses, when he had grown up, refused to be called the son of Pharaoh's daughter, choosing rather to share ill treatment with God's people, than to enjoy the pleasures of sin for a time; accounting the reproach of Christ greater riches than the treasures of Egypt; for he looked to the reward." Prayer: Creator and Maker of all, help me do things Your way and please You, so You are free to please me. Amen. Jeremiah 49-52 The final chapters of Jeremiah record the judgments on the remaining nations around Judah, and then two chapters of prophecy of the destruction of Babylon itself (which you can skip if you're short of time), to show that only God alone is to be trusted and served. Jeremiah gives hope of restoration to the captives, and ends with a recounting of the destruction of Jerusalem (also told in Jer 39) and the Temple. He will record his lament in Lamentations (next post). The book ends with God showing grace to Judah in Babylon. 49:1 Of the children of Ammon. Thus says Yahweh: Has Israel no sons? has he no heir? why then does “Mlk” possess Gad, and his people well in its cities? 2 Therefore, behold, the days come, says Yahweh, that I will cause an alarm of war to be heard against Rabbah of the children of Ammon; and it shall become a desolate heap, and her daughters shall be burned with fire: then shall Israel possess those who possessed him, says Yahweh. 3 Wail, Heshbon, for Ai is laid waste; cry, you daughters of Rabbah, clothe yourself in sackcloth: lament, and run back and forth among the fences; for Malcam shall go into captivity, his priests and his princes together. 4 Why do you glory in the valleys, your flowing valley, backsliding daughter? who trusted in her treasures, saying, who shall come to me? 5 Behold, I will bring a fear on you, says the Lord, Yahweh of Hosts, from all who are around you; and you shall be driven out every man right forth, and there shall be none to gather together the fugitives. 6 But afterward I will bring back the captivity of the children of Ammon, says Yahweh. 7 Of Edom. Thus says Yahweh of Hosts: Is wisdom no more in Teman? is counsel perished from the prudent? is their wisdom vanished? 8 Flee, turn back, dwell in the depths, inhabitants of Dedan; for I will bring the calamity of Esau on him, the time that I shall visit him. 9 If grape gatherers came to you, would they not leave some gleaning grapes? if thieves by night, wouldn’t they destroy until they had enough? 10 But I have made Esau bare, I have uncovered his secret places, and he shall not be able to hide himself: his seed is destroyed, and his brothers, and his neighbors; and he is no more. 11 Leave your fatherless children, I will preserve them alive; and let your widows trust in me. 12 For thus says Yahweh: Behold, they to whom it didn’t pertain to drink of the cup shall certainly drink; and are you he who shall altogether go unpunished? You shall not go unpunished, but you shall surely drink. 16 As for your terror, the pride of your heart has deceived you, O you who dwell in the clefts of the rock, who hold the height of the hill: though you should make your nest as high as the eagle, I will bring you down from there, says Yahweh. 17 Edom shall become an astonishment: everyone who passes by it shall be astonished, and shall hiss at all its plagues. 18 As in the overthrow of Sodom and Gomorrah and the neighbor cities of it, says Yahweh, no man shall dwell there, neither shall any son of man live therein. 19 Behold, he shall come up like a lion from the pride of the Jordan against the strong habitation: for I will suddenly make them run away from it; and whoever is chosen, him will I appoint over it: for who is like me? and who will appoint me a time? and who is the shepherd who will stand before me? 20 Therefore hear the counsel of Yahweh, that he has taken against Edom; and his purposes, that he has purposed against the inhabitants of Teman: Surely they shall drag them away, the little ones of the flock; surely he shall make their habitation desolate over them. 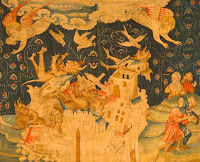 21 The earth trembles at the noise of their fall; there is a cry, the noise which is heard in the Red Sea. 22 Behold, he shall come up and fly as the eagle, and spread out his wings against Bozrah: and the heart of the mighty men of Edom at that day shall be as the heart of a woman in her pangs. 23 Of Damascus. Hamath is confounded, and Arpad; for they have heard evil news, they are melted away: there is sorrow on the sea; it can’t be quiet. 24 Damascus has grown feeble, she turns herself to flee, and trembling has seized on her: anguish and sorrows have taken hold of her, as of a woman in travail. 25 How is the city of praise not forsaken, the city of my joy? 26 Therefore her young men shall fall in her streets, and all the men of war shall be brought to silence in that day, says Yahweh of Hosts. 27 I will kindle a fire in the wall of Damascus, and it shall devour the palaces of Ben Hadad. 28 Of Kedar, and of the kingdoms of Hazor, which Nebuchadnezzar king of Babylon struck. Thus says Yahweh: Arise, go up to Kedar, and destroy the children of the east. 29 Their tents and their flocks shall they take; they shall carry away for themselves their curtains, and all their vessels, and their camels; and they shall cry to them, Terror on every side! 30 Flee, wander far off, dwell in the depths, you inhabitants of Hazor, says Yahweh; for Nebuchadnezzar king of Babylon has taken counsel against you, and has conceived a purpose against you. 31 Arise, go up to a nation that is at ease, that dwells without care, says Yahweh; that have neither gates nor bars, that dwell alone. 32 Their camels shall be a booty, and the multitude of their livestock a spoil: and I will scatter to all winds those who have the corners of their beards cut off; and I will bring their calamity from every side of them, says Yahweh. 33 Hazor shall be a dwelling place of jackals, a desolation forever: no man shall dwell there, neither shall any son of man live therein. 34 The word of Yahweh that came to Jeremiah the prophet concerning Elam, in the beginning of the reign of Zedekiah king of Judah, saying, 35 Thus says Yahweh of Hosts: Behold, I will break the bow of Elam, the chief of their might. 36 On Elam will I bring the four winds from the four quarters of the sky, and will scatter them toward all those winds; and there shall be no nation where the outcasts of Elam shall not come. 37 I will cause Elam to be dismayed before their enemies, and before those who seek their life; and I will bring evil on them, even my fierce anger, says Yahweh; and I will send the sword after them, until I have consumed them; 38 and I will set my throne in Elam, and will destroy from there king and princes, says Yahweh. 39 But it shall happen in the latter days, that I will bring back the captivity of Elam, says Yahweh. Observations: 49:1-6 Ammon was Moab's brother and Lot's other son. “Mlk” are the Hebrew root consonants of “king” (melek) or the Ammonite God (Molech/Milcom), which better fits the context, see verse 4. See Digging Deeper for how vowels were added to the consonantal text. They had encroached upon Judah's territory, trusted in their riches and false god rather than Yahweh, and thus would be judged with captivity. Like Judah and Moab, God would bring them back. 49:7-22 The Edomites were noted for their wisdom, which wouldn't save them, nor would their secure dwelling places. For the pride of their hearts (which deceived them into trusting themselves rather than God), God would make them like Sodom and Gomorrah. 49:23-27 Damascus, Syria (Aram in Hebrew), is next in line for judgment. The specific offense isn't mentioned, but Syria had joined with others in attacking the Israelites (2Kg 8:28, Isa 7:2). 49:28-39 The surrounding Arab nomadic clans/nations and the Persians (Elalm) round out the hit list, judged for their self-sufficiency. 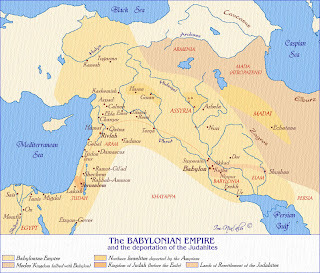 Elam is considered to be the Persians who were to the east of Babylon. God would bring Nebuchadnezzar against them as part of His plan to put all things under Babylon, and then destroy Babylon from the throne in Persia to show that Yahweh is God. Application: God will destroy whatever we trust in, so we will recognize that only He is worthy of our trust. Prayer: God, You alone are worthy of my trust; help me see and remove any idols that I have allowed to creep into my life. Thanks for Your faithfulness to me. Amen. 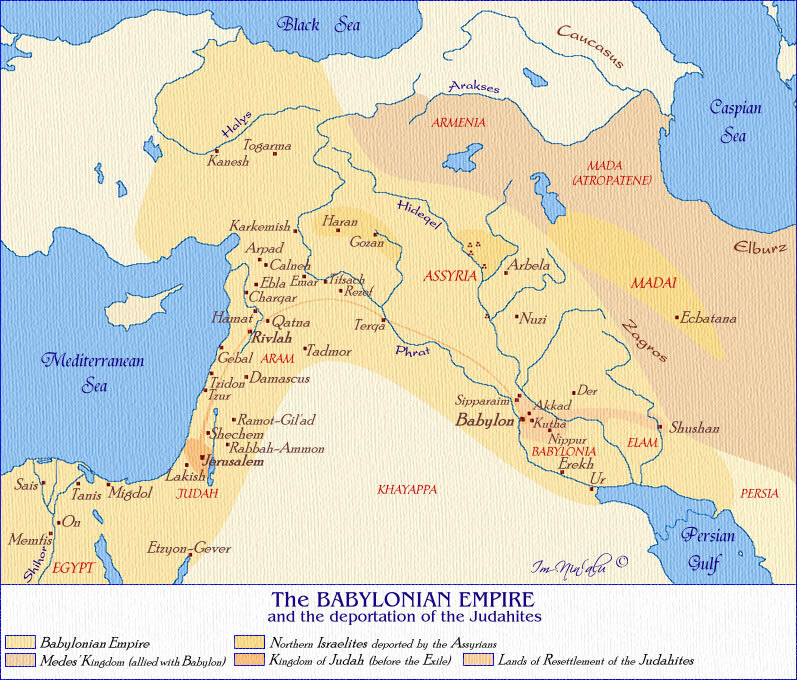 50:1 The word that Yahweh spoke concerning Babylon, concerning the land of the Chaldeans, by Jeremiah the prophet. 2 Declare among the nations and publish, and set up a standard; publish, and don’t conceal: say, Babylon is taken, Bel is shamed, Merodach is broken in pieces; her images are humiliated, her idols are broken in pieces. 3 For out of the north there comes up a nation against her, which shall make her land desolate, and none shall dwell therein: they are fled, they are gone, both man and animal. 4 In those days, and in that time, says Yahweh, the children of Israel shall come, they and the children of Judah together; they shall go on their way weeping, and shall seek Yahweh their God. 5 They shall inquire concerning Zion with their faces turned toward it, saying, Come, and join yourselves to Yahweh in an everlasting covenant that shall not be forgotten. 6 My people have been lost sheep: their shepherds have caused them to go astray; they have turned them away on the mountains; they have gone from mountain to hill; they have forgotten their resting place. 7 All who found them have devoured them; and their adversaries said, we are not guilty, because they have sinned against Yahweh, the habitation of righteousness, even Yahweh, the hope of their fathers. 8 Flee out of the midst of Babylon, and go forth out of the land of the Chaldeans, and be as the male goats before the flocks. 9 For, behold, I will stir up and cause to come up against Babylon a company of great nations from the north country; and they shall set themselves in array against her; from there she shall be taken: their arrows shall be as of an expert mighty man; none shall return in vain. 10 Chaldea shall be a prey: all who prey on her shall be satisfied, says Yahweh. 11 Because you are glad, because you rejoice, O you who plunder my heritage 13 Because of the wrath of Yahweh she shall not be inhabited, but she shall be wholly desolate 14 Set yourselves in array against Babylon all around, all you who bend the bow; shoot at her, spare no arrows: for she has sinned against Yahweh. 15 Shout against her all around: she has submitted herself; her bulwarks are fallen, her walls are thrown down; for it is the vengeance of Yahweh: take vengeance on her; as she has done, do to her. 16...for fear of the oppressing sword they shall turn everyone to his people, and they shall flee everyone to his own land. 17 Israel is a hunted sheep; the lions have driven him away: first, the king of Assyria devoured him; and now at last Nebuchadnezzar king of Babylon has broken his bones. 18 Therefore thus says Yahweh of Hosts, the God of Israel: Behold, I will punish the king of Babylon and his land, as I have punished the king of Assyria. 19 I will bring Israel again to his pasture, and he shall feed on Carmel and Bashan, and his soul shall be satisfied on the hills of Ephraim and in Gilead. 20 In those days, and in that time, says Yahweh, the iniquity of Israel shall be sought for, and there shall be none; and the sins of Judah, and they shall not be found: for I will pardon them whom I leave as a remnant. 21 Go up against the land...and utterly destroy them, says Yahweh, and do according to all that I have commanded you. 22 A sound of battle is in the land, and of great destruction. 23 How is the hammer of the whole earth cut apart and broken! how is Babylon become a desolation among the nations! 24 I have laid a snare for you, and you are also taken, Babylon, and you weren’t aware: you are found, and also caught, because you have striven against Yahweh. 28 The voice of those who flee and escape out of the land of Babylon, to declare in Zion the vengeance of Yahweh our God, the vengeance of his temple. 29...let none of it escape: recompense her according to her work; according to all that she has done, do to her; for she has been proud against Yahweh, against the Holy one of Israel. 31 Behold, I am against you, you proud one, says the Lord, Yahweh of Hosts; for your day has come, the time that I will visit you. 32 The proud one shall stumble and fall, and none shall raise him up; and I will kindle a fire in his cities, and it shall devour all who are around him. 33 Thus says Yahweh of Hosts: The children of Israel and the children of Judah are oppressed together; and all who took them captive hold them fast; they refuse to let them go. 34 Their Redeemer is strong; Yahweh of Hosts is his name: he will thoroughly plead their cause, that he may give rest to the earth, and disquiet the inhabitants of Babylon. 35 A sword is on the Chaldeans, says Yahweh, and on the inhabitants of Babylon, and on her princes, and on her wise men. 36 A sword is on the boasters, and they shall become fools; a sword is on her mighty men, and they shall be dismayed. 37 A sword is on their horses, and on their chariots, and on all the mixed people who are in the midst of her; and they shall become as women: a sword is on her treasures, and they shall be robbed. 38 A drought is on her waters, and they shall be dried up; for it is a land of engraved images, and they are mad over idols. 40 As when God overthrew Sodom and Gomorrah and the neighbor cities of it, says Yahweh, so shall no man dwell there, neither shall any son of man live therein. 41 Behold, a people comes from the north; and a great nation and many kings shall be stirred up from the uttermost parts of the earth. 43 The king of Babylon has heard the news of them, and his hands wax feeble: anguish has taken hold of him, pains as of a woman in labor. 44 Behold, the enemy shall come up like a lion from the pride of the Jordan against the strong habitation: for I will suddenly make them run away from it; and whoever is chosen, him will I appoint over it: for who is like me? and who will appoint me a time? and who is the shepherd who can stand before me? 45 Therefore hear the counsel of Yahweh, that he has taken against Babylon; and his purposes, that he has purposed against the land of the Chaldeans: Surely they shall drag them away, even the little ones of the flock; surely he shall make their habitation desolate over them. 46 At the noise of the taking of Babylon the earth trembles, and the cry is heard among the nations. 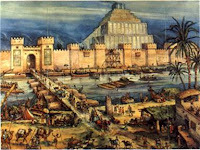 Observations: 50:1-46 Babylon (capital city of the land of the Chaldeans) would be destroyed, after being used by God to carry out His will against all the other nations. Bel (Baal) and Merodach (Marduk) were the principal deities, and would be shattered. Media (from the north) would join with the remains of Persia to devastate Babylon. Israel, in Babylonian captivity would seek Yahweh. 51:1 Thus says Yahweh: Behold, I will raise up against Babylon, and against those who dwell in Lebkamai, a destroying wind. 2 I will send to Babylon strangers, who shall winnow her; and they shall empty her land: for in the day of trouble they shall be against her around. 3 Against him who bends let the archer bend his bow, and against him who lifts himself up in his coat of mail: and don’t spare her young men; utterly destroy all her army. 5 For Israel is not forsaken, nor Judah, of his God, of Yahweh of Hosts; though their land is full of guilt against the Holy one of Israel. 6 Flee out of the midst of Babylon, and save every man his life; don’t be cut off in her iniquity: for it is the time of Yahweh’s vengeance; he will render to her a recompense. 7 Babylon has been a golden cup in Yahweh’s hand, who made all the earth drunken: the nations have drunk of her wine; therefore the nations are mad. 8 Babylon is suddenly fallen and destroyed: wail for her; take balm for her pain, if so be she may be healed. 9 We would have healed Babylon, but she is not healed: forsake her, and let us go everyone into his own country; for her judgment reaches to heaven, and is lifted up even to the skies. 10 Yahweh has brought forth our righteousness: come, and let us declare in Zion the work of Yahweh our God. 11 Make sharp the arrows; hold firm the shields: Yahweh has stirred up the spirit of the kings of the Medes; because his purpose is against Babylon, to destroy it: for it is the vengeance of Yahweh, the vengeance of his temple. 12 Set up a standard against the walls of Babylon, make the watch strong, set the watchmen, prepare the ambushes; for Yahweh has both purposed and done that which he spoke concerning the inhabitants of Babylon. 13 You who dwell on many waters, abundant in treasures, your end has come, the measure of your covetousness. 14 Yahweh of Hosts has sworn by himself, saying, Surely I will fill you with men, as with the canker worm; and they shall lift up a shout against you. 15 He has made the earth by his power, he has established the world by his wisdom, and by his understanding has he stretched out the heavens: 16 when he utters his voice, there is a tumult of waters in the heavens, and he causes the vapors to ascend from the ends of the earth; he makes lightning for the rain, and brings forth the wind out of his treasuries. 17 Every man has become brutish without knowledge. Every goldsmith is disappointed by his image; for his molten image is falsehood, and there is no breath in them. 18 They are vanity, a work of delusion: in the time of their visitation they shall perish. 19 The portion of Jacob is not like these; for he is the former of all things; and is the tribe of his inheritance: Yahweh of Hosts is his name. 24 I will render to Babylon and to all the inhabitants of Chaldea all their evil that they have done in Zion in your sight, says Yahweh. 25 Behold, I am against you, destroying mountain, says Yahweh, which destroys all the earth; and I will stretch out my hand on you, and roll you down from the rocks, and will make you a burnt mountain. 26 They shall not take of you a stone for a corner, nor a stone for foundations; but you shall be desolate for ever, says Yahweh. 27 Set up a standard in the land, blow the trumpet among the nations, prepare the nations against her, call together against her the kingdoms of Ararat, Minni, and Ashkenaz: appoint a marshal against her; cause the horses to come up as the rough canker worm. 28 Prepare against her the nations, the kings of the Medes, its governors, and all its deputies, and all the land of their dominion. 29 The land trembles and is in pain; for the purposes of Yahweh against Babylon do stand, to make the land of Babylon a desolation, without inhabitant. 33 For thus says Yahweh of Hosts, the God of Israel: The daughter of Babylon is like a threshing floor at the time when it is trodden; yet a little while, and the time of harvest shall come for her. 34 Nebuchadnezzar the king of Babylon has devoured me, he has crushed me, he has made me an empty vessel, he has, like a monster, swallowed me up, he has filled his maw with my delicacies; he has cast me out. 35 The violence done to me and to my flesh be on Babylon, shall the inhabitant of Zion say; and, my blood be on the inhabitants of Chaldea, shall Jerusalem say. 36 Therefore thus says Yahweh: Behold, I will plead your cause, and take vengeance for you; and I will dry up her sea, and make her fountain dry. 37 Babylon shall become heaps, a dwelling place for jackals, an astonishment, and a hissing, without inhabitant. 44 I will execute judgment on Bel in Babylon, and I will bring forth out of his mouth that which he has swallowed up; and the nations shall not flow any more to him: yes, the wall of Babylon shall fall. 45 My people, go away from the midst of her, and save yourselves every man from the fierce anger of Yahweh. 46 Don’t let your heart faint, neither fear for the news that shall be heard in the land; for news shall come one year, and after that in another year shall come news, and violence in the land, ruler against ruler. 47 Therefore, behold, the days come, that I will execute judgment on the engraved images of Babylon; and her whole land shall be confounded; and all her slain shall fall in the midst of her. 48 Then the heavens and the earth, and all that is therein, shall sing for joy over Babylon; for the destroyers shall come to her from the north, says Yahweh. 49 As Babylon has caused the slain of Israel to fall, so at Babylon shall fall the slain of all the land. 50 You who have escaped the sword, go, don’t stand still; remember Yahweh from afar, and let Jerusalem come into your mind. 51 We are confounded, because we have heard reproach; confusion has covered our faces: for strangers have come into the sanctuaries of Yahweh’s house. 52 Therefore, behold, the days come, says Yahweh, that I will execute judgment on her engraved images; and through all her land the wounded shall groan. 53 Though Babylon should mount up to the sky, and though she should fortify the height of her strength, yet from me shall destroyers come to her, says Yahweh. 54 The sound of a cry from Babylon, and of great destruction from the land of the Chaldeans! 55 For Yahweh lays Babylon waste 56 for Yahweh is a God of recompenses, he will surely requite. 57 I will make drunk her princes and her wise men, her governors and her deputies, and her mighty men; and they shall sleep a perpetual sleep, and not wake up, says the King, whose name is Yahweh of Hosts. 58 Thus says Yahweh of Hosts: The broad walls of Babylon shall be utterly overthrown, and her high gates shall be burned with fire; and the peoples shall labor for vanity, and the nations for the fire; and they shall be weary. 60 Jeremiah wrote in a book all the evil that should come on Babylon, even all these words that are written concerning Babylon. 61 Jeremiah said to Seraiah, When you come to Babylon, then see that you read all these words, 62 and say, Yahweh, you have spoken concerning this place, to cut it off, that none shall dwell therein, neither man nor animal, but that it shall be desolate forever. 63 It shall be, when you have made an end of reading this book, that you shall bind a stone to it, and cast it into the midst of the Euphrates: 64 and you shall say, Thus shall Babylon sink, and shall not rise again because of the evil that I will bring on her; and they shall be weary. Thus far are the words of Jeremiah. Observations: 51:1-64 Jeremiah gives hope to the captivity in telling them they should flee back to Judah when the King of Kings pays back Babylon at the hand of the Medes and Persians. God will judge Babylon for her pride, covetousness, and idolatry. By judging them, God will demonstrate that it was not their gods who gave them victory over everyone, but He was the one who purposed it, and raised up defeated nations to carry it out. 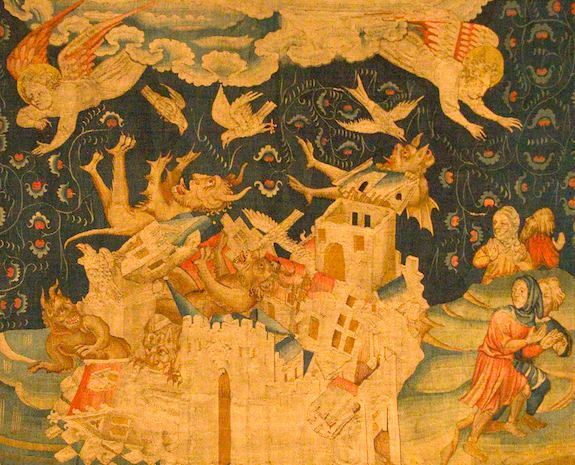 The judgment against Babylon was somewhat tempered by the repentance of Nebuchadnezzar and acknowledgment of Yahweh during Daniel's ministry, but many believe the city will reap a final fulfillment of this judgment in Revelation 17-18. Application: God will judge pride and idolatry even in the lives of those He uses to carry out His purposes, so all should live in humble fear of Him, knowing He will recompense. Prayer: God, may I live in holiness before You, so that I might not become an object of Your wrath. Amen. 52:1 Zedekiah was twenty-one years old when he began to reign; and he reigned eleven years in Jerusalem: and his mother’s name was Hamutal the daughter of Jeremiah of Libnah. 2 He did that which was evil in the sight of Yahweh, according to all that Jehoiakim had done. 3 For through the anger of Yahweh it happened in Jerusalem and Judah, until he had cast them out from his presence. Zedekiah rebelled against the king of Babylon. 4 It happened in the ninth year of his reign, in the tenth month, in the tenth day of the month, that Nebuchadnezzar king of Babylon came, he and all his army, against Jerusalem, and encamped against it; and they built forts against it round about. 5 So the city was besieged to the eleventh year of king Zedekiah. 6 In the fourth month, in the ninth day of the month, the famine was severe in the city, so that there was no bread for the people of the land. 7 Then a breach was made in the city, and all the men of war fled, and went forth out of the city by night by the way of the gate between the two walls, which was by the king’s garden; (now the Chaldeans were against the city all around;) and they went toward the Arabah. 8 But the army of the Chaldeans pursued after the king, and overtook Zedekiah in the plains of Jericho; and all his army was scattered from him. 9 Then they took the king, and carried him up to the king of Babylon to Riblah in the land of Hamath; and he gave judgment on him. 10 The king of Babylon killed the sons of Zedekiah before his eyes: he killed also all the princes of Judah in Riblah. 11 He put out the eyes of Zedekiah; and the king of Babylon bound him in fetters, and carried him to Babylon, and put him in prison until the day of his death. 12 Now in the fifth month, in the tenth day of the month, which was the nineteenth year of king Nebuchadnezzar, king of Babylon, came Nebuzaradan the captain of the guard, who stood before the king of Babylon, into Jerusalem: 13 and he burned the house of Yahweh, and the king’s house; and all the houses of Jerusalem, even every great house, burned he with fire. 14 All the army of the Chaldeans, who were with the captain of the guard, broke down all the walls of Jerusalem all around. 15 Then Nebular the captain of the guard carried away captive of the poorest of the people, and the residue of the people who were left in the city, and those who fell away, who fell to the king of Babylon, and the residue of the multitude. 16 But Nebuzaradan the captain of the guard left of the poorest of the land to be vineyard keepers and farmers. 17 The Chaldeans broke the pillars of brass that were in the house of Yahweh, and the bases and the bronze sea that were in the house of Yahweh in pieces, and carried all the of their brass to Babylon. 19 The captain of the guard took away the cups, the fire pans, the basins, the pots, the lampstands, the spoons, and the bowls; that which was of gold, in gold, and that which was of silver, in silver. 20 They took the two pillars, the one sea, and the twelve bronze bulls that were under the bases, which king Solomon had made for the house of Yahweh. 24 The captain of the guard took Seraiah the chief priest, and Zephaniah the second priest, and the three keepers of the threshold: 25 and out of the city he took an officer who was set over the men of war; and seven men of those who saw the king’s face, who were found in the city; and the scribe of the captain of the army, who mustered the people of the land; and sixty men of the people of the land, who were found in the midst of the city. 26 Nebuzaradan the captain of the guard took them, and brought them to the king of Babylon to Riblah. 27 The king of Babylon struck them, and put them to death at Riblah in the land of Hamath. So Judah was carried away captive out of his land. 28 This is the people whom Nebuchadnezzar carried away captive: in the seventh year three thousand twenty-three Jews; 29 in the eighteenth year of Nebuchadnezzar he carried away captive from Jerusalem eight hundred thirty-two persons; 30 in the three and twentieth year of Nebuchadnezzar Nebuzaradan the captain of the guard carried away captive of the Jews seven hundred forty-five persons: all the persons were four thousand and six hundred. 31 It happened in the seven and thirtieth year of the captivity of Jehoiachin king of Judah, in the twelfth month, in the five and twentieth day of the month, that Evilmerodach king of Babylon, in the first year of his reign, lifted up the head of Jehoiachin king of Judah, and brought him forth out of prison; 32 and he spoke kindly to him, and set his throne above the throne of the kings who were with him in Babylon, 33 and changed his prison garments. Jehoiachin ate bread before him continually all the days of his life: 34 and for his allowance, there was a continual allowance given him by the king of Babylon, every day a portion until the day of his death, all the days of his life. Observations: 52:1-23 This section elaborates the destruction first recorded in chapter 39, adding the burning and sacking of the Temple. It parallels 2Kings 24-25. 52:24-30 A recap of the three waves of exiles that were taken to Babylon. 52:31-34 The book ends with God extending grace to Jehoiachin (the Judean king, who reigned for three months before he was taken captive to Babylon for his evil in the Lord's sight). Nebuchadnezzar replaced him with Zedekiah, who became a vassal to Babylon. A new Babylonian king, Evilmerodach, came to the throne, and granted him favor. Yahweh watches over His people even while disciplining them. Application: God values obedience more than the finest temple on earth, because that better reflects His glory. Prayer: God, You are gracious, even in judgment; may I live to experience Your grace in blessing rather than discipline for unfaithfulness, disobedience, or seeking my will rather than Yours. You are worthy of my wholehearted love and service. Amen. The Hebrew consists of thee consonants, with prefixes and suffixes to form various forms of verbs, or nouns, or even prepositional phrases. The consonants are what was written (“kethiv”=what is written) in the original text, and the vowels (mainly dots and dashes) were added to assist readers in pronouncing the text (“qere”=what is read). The most famous kethiv-qere is the name of God, YHWH (a slightly morphed “He is” from “I am”). To avoid taking it in vain, the pious Jews would read “adonai” (=Lord) when they came across it in the text. So when the vowel points were added, a non-biblical hybrid “Jehovah” was created with the consonants of YHWH and the vowels of “adonai” (To see why Y=J, and W=V and how the vowels morphed, see this link). As mentioned above (Jer 49:1), “mlk” are the Hebrew consonants for “king” (melek) or the Ammonite God (Molech/Milcom). Milcom is Molech with the Hebrew vowels for “shame”, which is what was read in the synagogues. Jeremiah 49:3 refers to the priest and people of “mlk” which argues for Molech, and the matter is decided by looking at the previous chapter where Chemosh, the god of the Moabites is similarly addressed. So translators who used “king” instead of Molech weren't dong their job well and paying attention to context. God in a nutshell: God is the Creator, who orchestrates the events on this planet according to His purposes. He disciplines for the sake of holiness, and He pays back individuals and nations for their actions. Us in a nutshell: We can take comfort in the knowledge that God is in control, and is working out a plan for the ultimate benefit of those correctly related to Him. Knowing that God judges pride and idolatry should lead us to humbly depend upon Him exclusively, and seek His will wholeheartedly. 49:1 Of the children of Ammon. Thus says Yahweh: Has Israel no sons? has he no heir? why then does Malcam possess Gad, and his people well in its cities? 2 Therefore, behold, the days come, says Yahweh, that I will cause an alarm of war to be heard against Rabbah of the children of Ammon; and it shall become a desolate heap, and her daughters shall be burned with fire: then shall Israel possess those who possessed him, says Yahweh. 3 Wail, Heshbon, for Ai is laid waste; cry, you daughters of Rabbah, clothe yourself in sackcloth: lament, and run back and forth among the fences; for Malcam shall go into captivity, his priests and his princes together. 4 Why do you glory in the valleys, your flowing valley, backsliding daughter? who trusted in her treasures, saying, who shall come to me? 5 Behold, I will bring a fear on you, says the Lord, Yahweh of Hosts, from all who are around you; and you shall be driven out every man right forth, and there shall be none to gather together the fugitives. 6 But afterward I will bring back the captivity of the children of Ammon, says Yahweh. 7 Of Edom. Thus says Yahweh of Hosts: Is wisdom no more in Teman? is counsel perished from the prudent? is their wisdom vanished? 8 Flee, turn back, dwell in the depths, inhabitants of Dedan; for I will bring the calamity of Esau on him, the time that I shall visit him. 9 If grape gatherers came to you, would they not leave some gleaning grapes? if thieves by night, wouldn’t they destroy until they had enough? 10 But I have made Esau bare, I have uncovered his secret places, and he shall not be able to hide himself: his seed is destroyed, and his brothers, and his neighbours; and he is no more. 11 Leave your fatherless children, I will preserve them alive; and let your widows trust in me. 12 For thus says Yahweh: Behold, they to whom it didn’t pertain to drink of the cup shall certainly drink; and are you he who shall altogether go unpunished? You shall not go unpunished, but you shall surely drink. 13 For I have sworn by myself, says Yahweh, that Bozrah shall become an astonishment, a reproach, a waste, and a curse; and all its cities shall be perpetual wastes. 14 I have heard news from Yahweh, and an ambassador is sent among the nations, saying, Gather yourselves together, and come against her, and rise up to the battle. 15 For, behold, I have made you small among the nations, and despised among men. 16 As for your terror, the pride of your heart has deceived you, O you who dwell in the clefts of the rock, who hold the height of the hill: though you should make your nest as high as the eagle, I will bring you down from there, says Yahweh. 17 Edom shall become an astonishment: everyone who passes by it shall be astonished, and shall hiss at all its plagues. 18 As in the overthrow of Sodom and Gomorrah and the neighbour cities of it, says Yahweh, no man shall dwell there, neither shall any son of man live therein. 19 Behold, he shall come up like a lion from the pride of the Jordan against the strong habitation: for I will suddenly make them run away from it; and whoever is chosen, him will I appoint over it: for who is like me? and who will appoint me a time? and who is the shepherd who will stand before me? 20 Therefore hear the counsel of Yahweh, that he has taken against Edom; and his purposes, that he has purposed against the inhabitants of Teman: Surely they shall drag them away, the little ones of the flock; surely he shall make their habitation desolate over them. 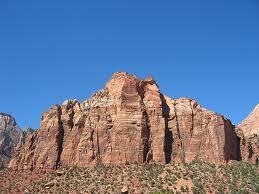 21 The earth trembles at the noise of their fall; there is a cry, the noise which is heard in the Red Sea. 22 Behold, he shall come up and fly as the eagle, and spread out his wings against Bozrah: and the heart of the mighty men of Edom at that day shall be as the heart of a woman in her pangs. 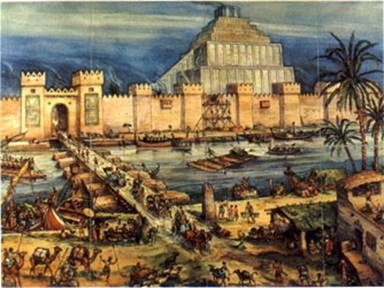 50:1 The word that Yahweh spoke concerning Babylon, concerning the land of the Chaldeans, by Jeremiah the prophet. 2 Declare among the nations and publish, and set up a standard; publish, and don’t conceal: say, Babylon is taken, Bel is disappointed, Merodach is dismayed; her images are disappointed, her idols are dismayed. 3 For out of the north there comes up a nation against her, which shall make her land desolate, and none shall dwell therein: they are fled, they are gone, both man and animal. 4 In those days, and in that time, says Yahweh, the children of Israel shall come, they and the children of Judah together; they shall go on their way weeping, and shall seek Yahweh their God. 5 They shall inquire concerning Zion with their faces turned toward it, saying, Come, and join yourselves to Yahweh in an everlasting covenant that shall not be forgotten. 6 My people have been lost sheep: their shepherds have caused them to go astray; they have turned them away on the mountains; they have gone from mountain to hill; they have forgotten their resting place. 7 All who found them have devoured them; and their adversaries said, we are not guilty, because they have sinned against Yahweh, the habitation of righteousness, even Yahweh, the hope of their fathers. 8 Flee out of the midst of Babylon, and go forth out of the land of the Chaldeans, and be as the male goats before the flocks. 9 For, behold, I will stir up and cause to come up against Babylon a company of great nations from the north country; and they shall set themselves in array against her; from there she shall be taken: their arrows shall be as of an expert mighty man; none shall return in vain. 10 Chaldea shall be a prey: all who prey on her shall be satisfied, says Yahweh. 11 Because you are glad, because you rejoice, O you who plunder my heritage, because you are wanton as a heifer that treads out the grain, and neigh as strong horses; 12 your mother shall be utterly disappointed; she who bore you shall be confounded: behold, she shall be the least of the nations, a wilderness, a dry land, and a desert. 13 Because of the wrath of Yahweh she shall not be inhabited, but she shall be wholly desolate: everyone who goes by Babylon shall be astonished, and hiss at all her plagues. 14 Set yourselves in array against Babylon all around, all you who bend the bow; shoot at her, spare no arrows: for she has sinned against Yahweh. 15 Shout against her all around: she has submitted herself; her bulwarks are fallen, her walls are thrown down; for it is the vengeance of Yahweh: take vengeance on her; as she has done, do to her. 16 Cut off the sower from Babylon, and him who handles the sickle in the time of harvest: for fear of the oppressing sword they shall turn everyone to his people, and they shall flee everyone to his own land. 17 Israel is a hunted sheep; the lions have driven him away: first, the king of Assyria devoured him; and now at last Nebuchadnezzar king of Babylon has broken his bones. 18 Therefore thus says Yahweh of Hosts, the God of Israel: Behold, I will punish the king of Babylon and his land, as I have punished the king of Assyria. 19 I will bring Israel again to his pasture, and he shall feed on Carmel and Bashan, and his soul shall be satisfied on the hills of Ephraim and in Gilead. 20 In those days, and in that time, says Yahweh, the iniquity of Israel shall be sought for, and there shall be none; and the sins of Judah, and they shall not be found: for I will pardon them whom I leave as a remnant. 21 Go up against the land of Merathaim, even against it, and against the inhabitants of Pekod: kill and utterly destroy after them, says Yahweh, and do according to all that I have commanded you. 22 A sound of battle is in the land, and of great destruction. 23 How is the hammer of the whole earth cut apart and broken! how is Babylon become a desolation among the nations! 24 I have laid a snare for you, and you are also taken, Babylon, and you weren’t aware: you are found, and also caught, because you have striven against Yahweh. 25 Yahweh has opened his armoury, and has brought forth the weapons of his indignation; for the Lord, Yahweh of Hosts, has a work to do in the land of the Chaldeans. 26 Come against her from the utmost border; open her storehouses; cast her up as heaps, and destroy her utterly; let nothing of her be left. 27 Kill all her bulls; let them go down to the slaughter: woe to them! for their day has come, the time of their visitation. 28 The voice of those who flee and escape out of the land of Babylon, to declare in Zion the vengeance of Yahweh our God, the vengeance of his temple. 29 Call together the archers against Babylon, all those who bend the bow; encamp against her all around; let none of it escape: recompense her according to her work; according to all that she has done, do to her; for she has been proud against Yahweh, against the Holy one of Israel. 30 Therefore her young men will fall in her streets, and all her men of war will be brought to silence in that day, says Yahweh. 31 Behold, I am against you, you proud one, says the Lord, Yahweh of Hosts; for your day has come, the time that I will visit you. 32 The proud one shall stumble and fall, and none shall raise him up; and I will kindle a fire in his cities, and it shall devour all who are around him. 33 Thus says Yahweh of Hosts: The children of Israel and the children of Judah are oppressed together; and all who took them captive hold them fast; they refuse to let them go. 34 Their Redeemer is strong; Yahweh of Hosts is his name: he will thoroughly plead their cause, that he may give rest to the earth, and disquiet the inhabitants of Babylon. 35 A sword is on the Chaldeans, says Yahweh, and on the inhabitants of Babylon, and on her princes, and on her wise men. 36 A sword is on the boasters, and they shall become fools; a sword is on her mighty men, and they shall be dismayed. 37 A sword is on their horses, and on their chariots, and on all the mixed people who are in the midst of her; and they shall become as women: a sword is on her treasures, and they shall be robbed. 38 A drought is on her waters, and they shall be dried up; for it is a land of engraved images, and they are mad over idols. 39 Therefore the wild animals of the desert with the wolves shall dwell there, and the ostriches shall dwell therein: and it shall be no more inhabited forever; neither shall it be lived in from generation to generation. 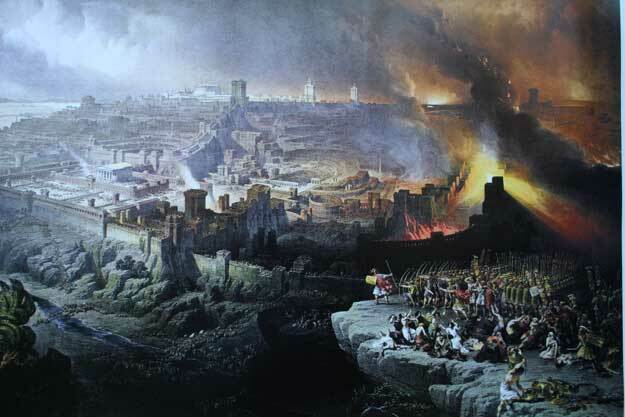 40 As when God overthrew Sodom and Gomorrah and the neighbour cities of it, says Yahweh, so shall no man dwell there, neither shall any son of man live therein. 41 Behold, a people comes from the north; and a great nation and many kings shall be stirred up from the uttermost parts of the earth. 42 They lay hold on bow and spear; they are cruel, and have no mercy; their voice roars like the sea; and they ride on horses, everyone set in array, as a man to the battle, against you, daughter of Babylon. 43 The king of Babylon has heard the news of them, and his hands wax feeble: anguish has taken hold of him, pains as of a woman in labour. 44 Behold, the enemy shall come up like a lion from the pride of the Jordan against the strong habitation: for I will suddenly make them run away from it; and whoever is chosen, him will I appoint over it: for who is like me? and who will appoint me a time? and who is the shepherd who can stand before me? 45 Therefore hear the counsel of Yahweh, that he has taken against Babylon; and his purposes, that he has purposed against the land of the Chaldeans: Surely they shall drag them away, even the little ones of the flock; surely he shall make their habitation desolate over them. 46 At the noise of the taking of Babylon the earth trembles, and the cry is heard among the nations. 51:1 Thus says Yahweh: Behold, I will raise up against Babylon, and against those who dwell in Lebkamai, a destroying wind. 2 I will send to Babylon strangers, who shall winnow her; and they shall empty her land: for in the day of trouble they shall be against her around. 3 Against him who bends let the archer bend his bow, and against him who lifts himself up in his coat of mail: and don’t spare her young men; utterly destroy all her army. 4 They shall fall down slain in the land of the Chaldeans, and thrust through in her streets. 5 For Israel is not forsaken, nor Judah, of his God, of Yahweh of Hosts; though their land is full of guilt against the Holy one of Israel. 6 Flee out of the midst of Babylon, and save every man his life; don’t be cut off in her iniquity: for it is the time of Yahweh’s vengeance; he will render to her a recompense. 7 Babylon has been a golden cup in Yahweh’s hand, who made all the earth drunken: the nations have drunk of her wine; therefore the nations are mad. 8 Babylon is suddenly fallen and destroyed: wail for her; take balm for her pain, if so be she may be healed. 9 We would have healed Babylon, but she is not healed: forsake her, and let us go everyone into his own country; for her judgment reaches to heaven, and is lifted up even to the skies. 10 Yahweh has brought forth our righteousness: come, and let us declare in Zion the work of Yahweh our God. 11 Make sharp the arrows; hold firm the shields: Yahweh has stirred up the spirit of the kings of the Medes; because his purpose is against Babylon, to destroy it: for it is the vengeance of Yahweh, the vengeance of his temple. 12 Set up a standard against the walls of Babylon, make the watch strong, set the watchmen, prepare the ambushes; for Yahweh has both purposed and done that which he spoke concerning the inhabitants of Babylon. 13 You who dwell on many waters, abundant in treasures, your end has come, the measure of your covetousness. 14 Yahweh of Hosts has sworn by himself, saying, Surely I will fill you with men, as with the canker worm; and they shall lift up a shout against you. 15 He has made the earth by his power, he has established the world by his wisdom, and by his understanding has he stretched out the heavens: 16 when he utters his voice, there is a tumult of waters in the heavens, and he causes the vapours to ascend from the ends of the earth; he makes lightning for the rain, and brings forth the wind out of his treasuries. 17 Every man has become brutish without knowledge. Every goldsmith is disappointed by his image; for his molten image is falsehood, and there is no breath in them. 18 They are vanity, a work of delusion: in the time of their visitation they shall perish. 19 The portion of Jacob is not like these; for he is the former of all things; and is the tribe of his inheritance: Yahweh of Hosts is his name. 20 You are my battle axe and weapons of war: and with you will I break in pieces the nations; and with you will I destroy kingdoms; 21 and with you will I break in pieces the horse and his rider; 22 and with you will I break in pieces the chariot and him who rides therein; and with you will I break in pieces man and woman; and with you will I break in pieces the old man and the youth; and with you will I break in pieces the young man and the virgin; 23 and with you will I break in pieces the shepherd and his flock; and with you will I break in pieces the farmer and his yoke; and with you will I break in pieces governors and deputies. 24 I will render to Babylon and to all the inhabitants of Chaldea all their evil that they have done in Zion in your sight, says Yahweh. 25 Behold, I am against you, destroying mountain, says Yahweh, which destroys all the earth; and I will stretch out my hand on you, and roll you down from the rocks, and will make you a burnt mountain. 26 They shall not take of you a stone for a corner, nor a stone for foundations; but you shall be desolate for ever, says Yahweh. 27 Set up a standard in the land, blow the trumpet among the nations, prepare the nations against her, call together against her the kingdoms of Ararat, Minni, and Ashkenaz: appoint a marshal against her; cause the horses to come up as the rough canker worm. 28 Prepare against her the nations, the kings of the Medes, its governors, and all its deputies, and all the land of their dominion. 29 The land trembles and is in pain; for the purposes of Yahweh against Babylon do stand, to make the land of Babylon a desolation, without inhabitant. 30 The mighty men of Babylon have forborne to fight, they remain in their strongholds; their might has failed; they are become as women: her dwelling places are set on fire; her bars are broken. 31 One runner will run to meet another, and one messenger to meet another, to show the king of Babylon that his city is taken on every quarter: 32 and the passages are seized, and the reeds they have burned with fire, and the men of war are frightened. 33 For thus says Yahweh of Hosts, the God of Israel: The daughter of Babylon is like a threshing floor at the time when it is trodden; yet a little while, and the time of harvest shall come for her. 34 Nebuchadnezzar the king of Babylon has devoured me, he has crushed me, he has made me an empty vessel, he has, like a monster, swallowed me up, he has filled his maw with my delicacies; he has cast me out. 35 The violence done to me and to my flesh be on Babylon, shall the inhabitant of Zion say; and, my blood be on the inhabitants of Chaldea, shall Jerusalem say. 36 Therefore thus says Yahweh: Behold, I will plead your cause, and take vengeance for you; and I will dry up her sea, and make her fountain dry. 37 Babylon shall become heaps, a dwelling place for jackals, an astonishment, and a hissing, without inhabitant. 38 They shall roar together like young lions; they shall growl as lions’ cubs. 39 When they are heated, I will make their feast, and I will make them drunken, that they may rejoice, and sleep a perpetual sleep, and not wake, says Yahweh. 40 I will bring them down like lambs to the slaughter, like rams with male goats. 41 How is Sheshach taken! and the praise of the whole earth seized! how is Babylon become a desolation among the nations! 42 The sea has come up on Babylon; she is covered with the multitude of its waves. 43 Her cities are become a desolation, a dry land, and a desert, a land in which no man dwells, neither does any son of man pass thereby. 44 I will execute judgment on Bel in Babylon, and I will bring forth out of his mouth that which he has swallowed up; and the nations shall not flow any more to him: yes, the wall of Babylon shall fall. 45 My people, go away from the midst of her, and save yourselves every man from the fierce anger of Yahweh. 46 Don’t let your heart faint, neither fear for the news that shall be heard in the land; for news shall come one year, and after that in another year shall come news, and violence in the land, ruler against ruler. 47 Therefore, behold, the days come, that I will execute judgment on the engraved images of Babylon; and her whole land shall be confounded; and all her slain shall fall in the midst of her. 48 Then the heavens and the earth, and all that is therein, shall sing for joy over Babylon; for the destroyers shall come to her from the north, says Yahweh. 49 As Babylon has caused the slain of Israel to fall, so at Babylon shall fall the slain of all the land. 50 You who have escaped the sword, go, don’t stand still; remember Yahweh from afar, and let Jerusalem come into your mind. 51 We are confounded, because we have heard reproach; confusion has covered our faces: for strangers have come into the sanctuaries of Yahweh’s house. 52 Therefore, behold, the days come, says Yahweh, that I will execute judgment on her engraved images; and through all her land the wounded shall groan. 53 Though Babylon should mount up to the sky, and though she should fortify the height of her strength, yet from me shall destroyers come to her, says Yahweh. 54 The sound of a cry from Babylon, and of great destruction from the land of the Chaldeans! 55 For Yahweh lays Babylon waste, and destroys out of her the great voice; and their waves roar like many waters; the noise of their voice is uttered: 56 for the destroyer has come on her, even on Babylon, and her mighty men are taken, their bows are broken in pieces; for Yahweh is a God of recompenses, he will surely requite. 57 I will make drunk her princes and her wise men, her governors and her deputies, and her mighty men; and they shall sleep a perpetual sleep, and not wake up, says the King, whose name is Yahweh of Hosts. 58 Thus says Yahweh of Hosts: The broad walls of Babylon shall be utterly overthrown, and her high gates shall be burned with fire; and the peoples shall labour for vanity, and the nations for the fire; and they shall be weary. 59 The word which Jeremiah the prophet commanded Seraiah the son of Neriah, the son of Mahseiah, when he went with Zedekiah the king of Judah to Babylon in the fourth year of his reign. Now Seraiah was chief quartermaster. 60 Jeremiah wrote in a book all the evil that should come on Babylon, even all these words that are written concerning Babylon. 61 Jeremiah said to Seraiah, When you come to Babylon, then see that you read all these words, 62 and say, Yahweh, you have spoken concerning this place, to cut it off, that none shall dwell therein, neither man nor animal, but that it shall be desolate forever. 63 It shall be, when you have made an end of reading this book, that you shall bind a stone to it, and cast it into the midst of the Euphrates: 64 and you shall say, Thus shall Babylon sink, and shall not rise again because of the evil that I will bring on her; and they shall be weary. Thus far are the words of Jeremiah. 12 Now in the fifth month, in the tenth day of the month, which was the nineteenth year of king Nebuchadnezzar, king of Babylon, came Nebuzaradan the captain of the guard, who stood before the king of Babylon, into Jerusalem: 13 and he burned the house of Yahweh, and the king’s house; and all the houses of Jerusalem, even every great house, burned he with fire. 14 All the army of the Chaldeans, who were with the captain of the guard, broke down all the walls of Jerusalem all around. 15 Then Nebuzaradan the captain of the guard carried away captive of the poorest of the people, and the residue of the people who were left in the city, and those who fell away, who fell to the king of Babylon, and the residue of the multitude. 16 But Nebuzaradan the captain of the guard left of the poorest of the land to be vineyard keepers and farmers. 17 The Chaldeans broke the pillars of brass that were in the house of Yahweh, and the bases and the bronze sea that were in the house of Yahweh in pieces, and carried all the of their brass to Babylon. 18 They also took away the pots, the shovels, the snuffers, the basins, the spoons, and all the vessels of brass with which they ministered. 19 The captain of the guard took away the cups, the fire pans, the basins, the pots, the lampstands, the spoons, and the bowls; that which was of gold, in gold, and that which was of silver, in silver. 20 They took the two pillars, the one sea, and the twelve bronze bulls that were under the bases, which king Solomon had made for the house of Yahweh. The brass of all these vessels was without weight. 21 As for the pillars, the height of the one pillar was eighteen cubits; and a line of twelve cubits encircled it; and its thickness was four fingers. It was hollow. 22 A capital of brass was on it; and the height of the one capital was five cubits, with network and pomegranates on the capital all around, all of brass: and the second pillar also had like these, and pomegranates. 23 There were ninety-six pomegranates on the sides; all the pomegranates were one hundred on the network all around. Jeremiah 30-33 New Covenant Coming!